Gene diets – where is the science? We are entering a new era in medicine – where doctors can tailor each patient’s healthcare around his or her health needs. In this era of P4 medicine – predictive, pro-active, preventive and participatory healthcare – these needs will be defined in terms of a person’s risk of disease. Central to early risk identification is genomics – a guiding tool for pro-active intervention and more precise treatment (pharmacogenomics) of disease. This science offers information on genetic variation and allows physicians to develop a holistic, pro-active healthcare strategy that is based on the patient’s susceptibility to different diseases and his or/her reactions to different treatments. Almost all chronic illnesses (e.g. diabetes) commonly found are strongly influenced by the impact of our lifestyle on our gene map. Direct-to-consumer (DTC) companies like 23andme have recently emerged, packaging genetic information in a “user-friendly” format for consumers. Consumer genetics has often been discussed in the lay press – understandably with much professional scepticism surrounding the usefulness of testing someone outside of the context of his/her current health status and family history. However, it remains a strong predictor of health risks. Incorporating genomic medicine into clinical practice will enable your patients to participate in their healthcare under professional supervision. A risk screen allows an opportunity to tailor lifestyle to minimise the impact of environment (e.g. diet or smoking) on genes. Genomic medicine is here to stay. As tests rapidly become more affordable and stronger scientific associations can be made between markers, environmental triggers and eventual disease outcomes, they will become part of standard practice. We will have detailed molecular analyses of all tumours (enabling optimal management) and a growing list of markers that will allow targeted intervention due to stronger associations between markers and disease. This will inevitably lead to an emphasis on individualised management and even disease prevention. Actionable genetic risks allow individuals to participate in health maintenance through the implementation of a healthy lifestyle. You can be part of the value chain of behavioural health services associated with genetic profiling through the Genetic Care Centre. Health professionals can now apply cutting-edge genomic knowledge to health and disease management without needing a degree in genetics. By integrating your patients’ genetics with their clinical and environmental risk factors, you can formulate treatment programmes tailored to the exact needs of each individual. A step-by-step guide to order tests online is provided. Genomic medicine aims to identify gene-environment mismatches in an individual and use this information to prevent cumulative effects that may lead to disease development or progression. A single genetic risk factor cannot cause complex chronic disorders like diabetes mellitus, metabolic syndrome, vascular inflammatory disorders, Alzheimer’s disease or demyelenating diseases like multiple sclerosis or inflammatory conditions like rheumathoid arthirits. The unique Gknowmix test concept can combine the analysis of both high-penetrance genes (diagnostic, risk assessment) and low-penetrance genes (contributing factors, targets for treatment) in the context of your patient’s personal and family history, clinical parameters, and lifestyle risk factors where applicable. A specific genetic test is performed only once in a lifetime. It involves a laboratory analysis of the genetic material extracted from cells obtained from a blood sample or cheek swab. Surgical biopsies may also be used in some patients to perform transcriptional profiling for prognostic and risk assessment purposes. The laboratory work is performed at SANAS accredited facilities, while interpretation of the results is the responsibility of medical scientists involved in the test development process. The test results are provided in a comprehensive report which not only focuses on diagnosis and treatment, but also explains how gene expression can be altered by changing/removing external factors such as diet, smoking, medication and environmental toxins. The rapid increase of genetic knowledge and the ensuing exploitation of early adopters has led to a disconnect between professionals able to offer these services and patients/clients requesting tests as there is almost always a geographical separation. Also, as applied clinical genetics has not been part of health professionals’ mainstream training, very few physicians in private practice are familiar with the values of these tests. Registered healthcare practitioners can order genetic counselling/testing on behalf of their patients/clients. Registered physicians can accept clients outside their practice for telephonic counselling for a fee. Interdisciplinary referrals can be made as optimal client management almost always involves, among others, dieticians, physicians, genetic councillors, genetic scientists and biokineticists. Appropriate consultation fees apply. Physicians, oncologists, surgeons and gynaecologists provide specialist opinions in particular to the management of cancer risk. Based on our philosophy to offer genetic testing to the public via professional resources, genetic counselling is integral to this service. There are currently no standard practice requirements for practicing applied genetics in clinical offices. Continuous training is offered to interested parties, with dieticians and general practitioners currently showing the most interest. Moreover, genetic counselling’s emphasis shifted to multi-factorial lifestyle diseases. Genetic counsellors and clinicians who are experienced in the application of genetic testing are actively involved in professional development through CPD-accredited workshops and one-on-one training. These activities of the Genetic Care Centre have already empowered numerous healthcare practitioners to not only advise their patients on genetic testing, but also to implement ongoing monitoring following genetic testing. For more information on the Genetic Care Centre, email info@blueprinthealth.co.za. WHICH TEST WILL MY PATIENT BENEFIT FROM? Genetic testing allows many valuable opportunities to improve the management of conditions that are influenced by lifestyle including heart disease, stroke, diabetes and some cancers. It also enables you to distinguish whether the disease should be treated with medication or a simple lifestyle change. While it does not predict risk, it provides target areas that can be influenced by nutrition, supplementation or changes in lifestyle e.g. quitting smoking and increasing exercise. In the future, physicians will be guided by artificial expert systems in selecting evidence-based treatment options. Information provided in genetic test reports relates to gene-drug (pharmacogenetics) and gene-diet (nutrigenetics) interactions. Pharmacogenomics guides optimum treatment (right choice and correct dosage) and helps one avoid unnecessary side-effects. It can be applied when treating cancer, infectious diseases and psychiatric health, and when prescribing blood thinning drugs or transplant medicine. Nutrigenomics plays a central role in disease prevention and involves nutrition, fitness, stress management and changing bad habits like smoking and excessive alcohol intake. The mutations identified in the risk management tests are involved in key metabolic processes. Some direct transport or the uptake of nutrients, while others play an important role in blood clotting, inflammation, removal of environmental toxins, or response to medication. In contrast to a typical pathology test that measures the effect of a gene product, a molecular genetic test identifies a genetic change before any symptoms develop. This enables the potential implementation of preventative measures before the development of clinically significant pathology. It also allows treatment of diseases with regular evidence-based treatment options to be targeted at the cause. The selection of test type is guided by the patient’s family history, his/her current health status or by his/her desire for a customised health plan. When in doubt about the relevance of a test for your patient, contact a genetic councillor. For individuals with cardiovascular disease (CVD), a family history of heart disease or dementia (Alzheimer’s disease), or with CVD risk factors, such as high cholesterol, Type II diabetes, obesity, hypertension or chronic inflammation. The Cardiovascular Genescreen distinguishes between high-risk individuals who require long-term medical treatment and those who have an increased risk of CVD and related disorders due to less severe gene-environment interactions. In contrast to conventional assessments, it provides information on risk factors that are predictive of future clinical outcomes. While individual markers may exert a modest effect in isolation, a combination of functional genetic variations may have a substantial influence on the development or progression of particular conditions. By identifying multiple risk factors that may interact with each other thereby increasing the risk, a cumulative effect leading to disease development or progression could be prevented through targeted intervention. A population-specific familial hypercholesterolaemia (FH) test including eight gene defects in the LDL receptor gene. A globally applicable multi-gene cardiovascular disease (CVD) test tests for 12 mutations in 10 different genes involved in lipid metabolism (ApoE2, ApoE4), folate metabolism (MTHFR), blood clotting (Factor V Leiden, Prothrombin, Factor XIII, PAI) and iron overload (HFE). Individuals with a family history of chronic disorders such as cardiovascular disease, Type II diabetes, obesity, Alzheimer’s disease and some forms of cancer (e.g. breast, prostate, colon). Individuals with an early onset of cardiovascular disease, deep vein thrombosis, obesity, Type II diabetes and metabolic syndrome. Those concerned about the risk of sporadic cancers. Information on any food allergies or intolerance is taken into account to develop a health plan tailored to the individual’s needs. Alone, the high-frequency, low-expression gene variations included in the Wellness Genescreen are not deterministic in the development of chronic disorders. They may however increase the risk imposed by environmental factors such as smoking, physical inactivity, or unhealthy food choices that may lead to the impairment of key enzymes that require certain micro-nutrients as co-factors to function normally. The identification of genetic and environmental risk factors allows for effective intervention. The knowledge that a functional genetic change may remain unexpressed in a low-risk environment but turn into disease in a high-risk environment empowers patients to take responsibility for their health. Pathology testing performed as part of nutrigenetic tests (where appropriate) has proven valuable in determining whether a susceptibility allele is expressed, due to a gene-environment mismatch, to monitor response to treatment, and to ensure that the dietary requirements relating to a particular gene variation are met. This is a non-diagnostic test (testing for 16 mutations) for identifying susceptibilities that, in the absence of an appropriate diet and lifestyle intervention, may lead to premature aging and disease. It includes clinically useful genes involved in lipid metabolism (ApoE2,Apo E4), folate metabolism (MTHFR), blood clotting (Factor V, Prothrombin, PAI,), iron metabolism (HFE), inflammation (relating to Type II diabetes, obesity and hypertension) NB3,PPARgamma, IL6), oxidative stress(TNFalpha), detoxification of carcinogens (GSTT1,GSTM1, MnSOD, COMT) and oestrogen exposure. The discovery that genes may overlap between CVD and other complex conditions – such as Alzheimer’s disease, recurrent miscarriages, metabolic syndrome and some forms of cancer – has paved the way to this new approach in healthcare. This universal panel includes clinically useful multi-functional genes implicated in the development or progression of many common medical conditions as part of the pathology-supported genetic testing approach, which combines genetic profiling with clinical parameters to pro-actively manage a patient’s risk of disease. We are all too familiar with the high prevalence of breast cancer. Responsible screening is pertinent after age 40, while it is routinely advocated earlier in females with a direct family member being affected (mother or sister) – 10 earlier than disease onset in the youngest victim. The BRCA 1 and 2 screens now provide an alternative to those individuals affected by direct family members with breast cancer. Familial risk: Four close relatives diagnosed younger than 60 years; three close relatives diagnosed younger than 50 years; two close relatives diagnosed younger than 60 years as well as ovarian cancer in the family; male breast cancer and any family history of breast cancer. Ethnic risk: Founder populations such as patients with Ashkenazi Jewish or Afrikaner ancestry with a family history of breast cancer. Personal risk: Bilateral breast cancer at a relatively young age; ovarian cancer diagnosed younger than 30 years. The importance of genetic counselling in the context of BRCA testing cannot be overemphasized. The implications of a potential positive/negative test result needs to be carefully considered in relation to treatment options. An abnormal test result in a healthy individual justifies intensified screening intervals to detect any signs of cancer development at an early stage – when the cancer is most treatable and curable. Some women may consider prophylactic surgery before cancer cells have an opportunity to form, but although the risk is significantly reduced it is not entirely eliminated. Testing may also be beneficial in patients who are already diagnosed with cancer, since detection of a BRCA mutation would improve the accuracy of risk assessment on which to base future treatment decisions and surveillance intervals. Having knowledge of a genetic abnormality may also influence treatment decisions (e.g. tamoxifen) and implementation of lifestyle changes. In King et al.’s (2003) landmark study on Ashkenazi Jewish women, it was shown that a healthy lifestyle could protect BRCA1 and BRCA2 mutation carriers from developing cancer. When considering a BRCA test for your patient, you can discuss management options with a genetic councillor. Mutation-specific: To screen at-risk family members for a known mutation previously identified in the index patient diagnosed with breast/ovarian cancer. Population-specific: To screen for a limited number of mutations occurring at an increased frequency in certain ethnic groups (e.g. Ashkenazi Jews, Afrikaners of European descent). Full gene screen: To identify the cancer-causing mutation in affected or high-risk patients who tested negative during the initial screen for family/population-specific mutations. Haemochromatosis has been classified as the most common genetic disorder worldwide. In Caucasian populations, approximately one in ten people carry a faulty gene which, when inherited from both parents, could lead to an iron overload if preventative measures (e.g. phlebotomy) are not implemented at an early stage. The haemochromatosis test not only focuses on the identification or exclusion of genetic risk factors, but also on the documentation of clinical conditions, abnormal biochemistry and environmental factors that may influence disease development. Recognising early non-specific features of iron overload such as fatigue, joint pain, abdominal pain and loss of libido or finding a high ferritin might indicate haemochromatosis. Once diagnosed, preventive measure like phlebotomy can reduce the risk of cancer, heart disease, diabetes, arthritis, infertility and many other complications of organ damage due to the over-absorption of iron from the diet. Click here to read more. The cardiomyopathy of idiopathic or acquired haemochromatosis suggests that the heart may be especially sensitive to the toxic effects of excess iron (Sullivan 1990). The features of inherited iron overload include cardiac problems (arrhythmias and heart failure), and/or cirrhosis of the liver, diabetes, arthritis and skin pigmentation. Since haemochromatosis can be easily treated with phlebotomy once diagnosed, this condition is considered to prevent heart disease and other equally dangerous health risks. Navigate to the Gknowmix website. Click on the “log in” button and register/log in as a Genetic Care Centre professional by choosing the option “Registered Healthcare Practitioner”. Please provide your practice number. Once you have logged on, you will be directed to your home page. From here, you will be able to order various services. REQUEST A GENETIC SERVICE ONLINE: Click the button “Request a Service” and choose the required GeneScreen. You can also request genetic counselling online if the patient requires more information. PROVIDE THE NECESSARY INFORMATION: Under Service Options, select the required test type in the first line of the online form and complete the screens for the patient as far as possible. If the patient does not have an email address, please provide your practice’s email address. Some of the pathology results may not be available at the time the test is requested and may be added at a later stage by editing the profile. Please use the “no emails” option when additional information is added, otherwise the test quote and informed consent form will be emailed to the patient a second time. PAYMENT: Click the button to view your quote including the price and relevant medical aid tariff codes. To complete the test request press “Accept and Save Changes” indicated in the middle of the quote that will also be emailed to the patient. SPECIMEN COLLECTION AND TRANSPORT: Please return to the main screen on the Gknowmix website to select the online option for ordering a test kit for sample collection. Once the sample is ready for collection, please email courier@gknowmix.com to arrange a pick-up by providing the address from where the sample must be collected. In this section, we touch on the basics of genetics. More information is available in the various references listed below. 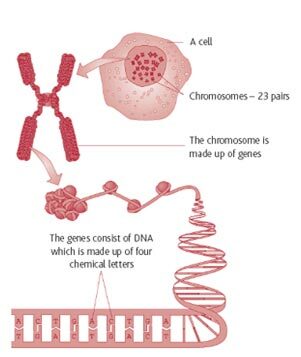 And when combined, they form a chromosome (paragraph) of which each person has 23 pairs inside each cell. All people have abnormal genes. Mistakes (mutations) can occur on a base pair level (called a SNP) (wrong word) or on a chromosome level (missing paragraph). These mistakes could lead to poor functioning and, in severe cases, could cause diseases (e.g. Down’s syndrome). However, the presence of SNP mutations is NOT equivalent to disease as most chronic diseases are multi-factorial, implying that there are gene-gene and gene-environment interactions that trigger expression. Several articles and e-books on genetics are available. Please click here.